Antenna Type: 90 ft "T"
19 SEP 1944 – BM2c James O. McKeehan lost his life while loading construction crew & material onto to the SPICEWOOD. The barge broke a mooring bit, the ramp cable parted causing the barge to flood. In the confusion, the BM2c fell overboard into shark infested waters. BM1c Kenneth E. Foreman and MoMM2c Joseph Letko jumped into the water to render assistance. No trace was found of him. 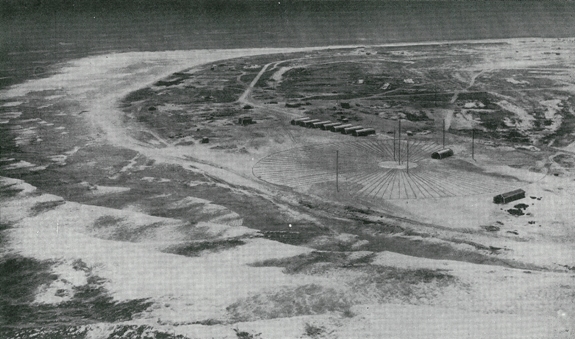 Aerial view of a typical ground station (located on Baker Island of the Phoenix Islands group). Photo from MIT Radiation Laboratory Series Volume 4 Loran.